This article is republished from the Death of a Million Trees website with permission and minor edits. 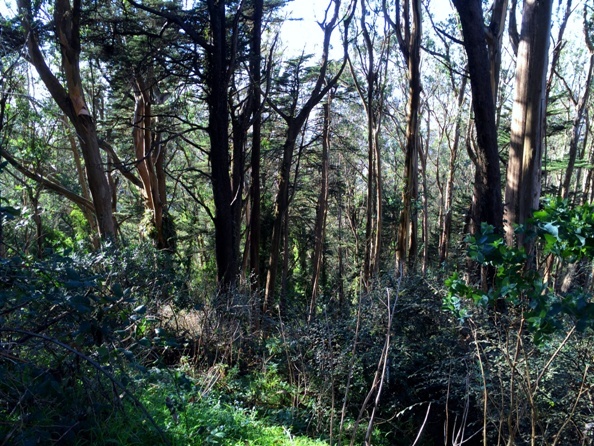 The San Francisco Forest Alliance (SFFA) has announced (see below) the successful conclusion of a year-long process of developing a policy for the management of San Francisco’s urban forest by the city’s Urban Forestry Council (UFC). If you have not been closely following the development of this policy it may be difficult to appreciate the importance of this accomplishment. Native plant advocates made every effort to prevent the UFC from adopting a policy that would make a commitment to the preservation of the urban forest. As our readers know, native plant advocates want the entire urban forest to be destroyed because it is non-native, so they can attempt to recreate native grassland and scrub that existed at the end of the 18th century, prior to the arrival of Europeans. They started with the claim that the forest is diseased and dying and must be destroyed. With the help of arborists and our usual independent research, we were able to disprove this particular story line. Then they claimed that forest health would be improved by radical thinning of the forest. Again, our research was able to prove that mature forests do not benefit from thinning because mature trees are unable to respond positively to increased light and wind. The trees that remain are actually more vulnerable to windthrow because they are not adapted to increased wind. Then they claimed that the forest is dying of drought and must be destroyed to prevent the dead trees from becoming a fire hazard. Again, our research was able to prove that our eucalyptus forest is drought-tolerant and is actually more likely to survive the drought than the native plants which will not precipitate as much fog drip as tall trees. However, the final document contains an erroneous claim that the drought has “serious negative effects to mature trees.” In fact, young trees require more water than mature trees. In December 2014, after listening to six months of these horror stories, it seemed that the UFC was headed in the wrong direction. Their questions and comments, as well as the meetings we were able to arrange, seemed to indicate they were prepared to endorse the destruction of our urban forest. In January 2015, the first draft of the UFC policy confirmed our worst fears. They endorsed “land conversion” from forest to native grassland and scrub and the use of herbicides to prevent the resprouting of the forest. Having done everything we could to prevent this outcome, we despaired. And then the UFC produced a revised draft in April 2015 which was a 180-degree turn from the first draft. We will never know what turned the UFC around, but we surely had a hand in it. Even if there was some unseen influence operating in the background, our viewpoint was confirmed and vindicated by the final outcome. The UFC then postponed approval of their document, saying they were waiting for public comments from one of the stakeholders. I presume this delay was requested by the Recreation and Park Department, because the final revision of the document accommodated its so-called Natural Areas Program by stating that “management priorities and decisions for some of the mature and historic tree stands [within the “natural areas”] may be different from management practices for other areas of the urban forest.” However, written comments from the Recreation and Park Department were not visible to us. We are taking the time to tell you about this accomplishment because we hope you will be encouraged by it. Sometimes the odds seem overwhelmingly against our efforts to save our urban forest. But with tenacity and commitment, it is possible to prevent bad things from happening. We are deeply grateful to those who participated in this successful effort to prevent the development of an official city policy that could have endorsed the destruction of our urban forest. Much remains to be done. Do not give up hope that we can save our urban forest. Please renew your commitment to our efforts. This week the Urban Forestry Council of the Dept. of Environment accepted a document now called“Guidelines for Managing Mature and Historic Tree Stands,” which had originally been called “Best Management Practices for Urban Forests.” It was written largely by John Leffingwell of HORT Science who sits on the Council, with assistance from Mei Ling Hui, staff member from Dept. of Environment; John Flanagan, Chair of the Council; and Igor Lacan, who also sits on the Council and works for the San Mateo-San Francisco Cooperative Extension service. The document went through several iterations, starting back with its first draft in January 2015, which followed six months of meetings and presentations in 2014. By April 2015 it had been completely revised and had moved away from its earlier endorsement of restoration ecology and the native plant agenda of destroying blue gum eucalyptus forests. Unfortunately, it was passed including one section called “Competing Land Use Priorities” that provides a disclaimer for the Natural Areas Program to treat its trees differently than other urban forests in the name of “protecting San Francisco’s ‘remnant fragments’ of its original landscape.” That section could, at some later date, be used by Rec and Park as endorsement of their destructive plans in the Natural Areas. However, there is much in the document that would mitigate against that destruction, including a section called “Protect and sustain iconic forest stands.” This section argues that our mature and historic tree stands “are character defining features of the city that provide unique experiences to those who enjoy them” and should be “protected and managed for their cultural and social benefits to residents and visitors.” Their importance is “evidenced by community groups formed around the protection and management of these sites” [Note: that would probably mean the SF Forest Alliance and Concerned Citizens for the Maintenance Alternative.] Although this document may not sound important, it is. It will be used as a guideline by the Urban Forestry Council whenever issues or plans related to the urban forests are brought before them. Potentially, the Board of Supervisors might refer to it as well when there is an appeal of the EIR for the Natural Areas Program’s management plan. It took a year’s worth of volunteer hours from SF Forest Alliance leaders who attended meetings, made comments and presentations. Additionally, others, including Dr. Joe R. McBride and members of the Hills Conservation Network made presentations before the Council supporting our point of view. We see it as a small step in the right direction. 1) We encourage you to visit our Blog at SFForest.net. Enter your email address as the top right (“sign me up”) in order to receive our updates directly to our email. 2) If you’re on Facebook, please “Like” our page www.facebook.com/Forest Alliance. We currently have 424 “likes.” Help us to take it over 450! We welcome your interest and support! Thank you, Forest Alliance, for bird-dogging this important policy and preventing what could have been a disaster for San Francisco’s urban forest. Well done!! Wow! I can’t believe this good news! Congratulations to all who have fought so hard and so long!